Torleif Thedéen is one of the most highly regarded cellists working today, regularly playing with many of the world’s major orchestras, including Beethoven Triple Concerto with the Wiener Symphoniker and the Orchestre Philharmonique de Bordeaux, Haydn Cello Concerto with the Deutsches Symphonie-Orchester Berlin, Tchaikovsky Variations on a Rococo Theme with the Royal Philharmonic Orchestra and the Berliner Symphoniker, Elgar Cello Concerto with the London Philharmonic Orchestra and the City of Birmingham Symphony Orchestra , Schnittke Cello Concerto 2 with the Dresdner Philharmonie and the BBC Philharmonic, Dvorak Cello Concerto with the Czech Philharmonic Orchestra and the City of Birmingham Symphony Orchestra, the Schoenberg Cello Concerto with the Berliner Symphoniker, the Shostakovich Cello Concerto 2 with the Moscow Philharmonic Orchestra, the Schumann Cello Concerto with the Rotterdam Philharmonic, the Saint Saens Cello Concerto with the Israel Sonfinietta, the Dutilleux Cello Concerto with the Stuttgart Philharmonic and the Brahms Double Concerto with Alina Ibramigova and the Hallé Orchestra in Manchester and with Janine Jansen and the Royal Stockholm Philharmonic – under conductors including Esa-Pekka Salonen, Paavo Berglund, Neeme Järvi, Franz Welser-Möst, Gennady Rozhdestvensky, Leif Segerstam, and Eri Klas. 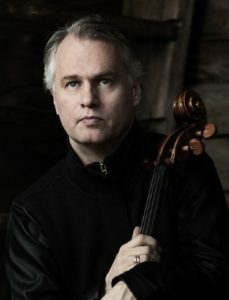 Torleif Thedéen is also active as a chamber musician, and as such appears in prestigious concert venues worldwide such as Wigmore Hall in London, the Carnegie Recital Hall in New York and the Concertgebouw in Amsterdam. He often participates in prestigious Music Festivals, among them the Verbier Festival, Prague Spring Festival, the festivals in Schleswig-Holstein, Bordeaux, Oslo, Bath, Stavanger and Kuhmo. Since 1986 Thedéen has recorded numerous CD’s for BIS, featuring standard repertoire works as well as contemporary music, including the renowned Dvorak Cello Concerto. His CD with the Shostakovich Cello Concertos won the Cannes Classical Award in 1995, and his recording of J.S. Bach Solo Suites for cello was named Editor’s choice in BBC Music Magazine, Nov 2001. Thedéen has toured with soloists including Julian Rachlin and Janine Jansen to European festivals, New Zealand, and Australia. He has also toured Scandinavia and England with the Musica Vitae Chamber Orchestra of Sweden. Thedéen has toured worldwide with Janine Jansen & Maxim Rysanov, following a CD recording with DECCA, he performed with the London Philharmonic Orchestra (conducted by Mario Venzago) in London, toured with the BBC Welsh Symphony Orchestra, and recorded with NDR Orchestra in Hannover, Germany. Career highlights include concerts in Finland, Spain, and a Chamber Music tour which including appearances at the Wigmore Hall and Carnegie Hall. Recent appearances included performances at the Helleruplund Kirke and the Hørsholm Musikforening in Denmark, an Australasian Tour including performances with the Auckland Philharmonia and the Tasmanian Symphony Orchestra. Torleif Thedéen was appointed Professor at the Norwegian Academy of Music in Fall of 2017 and has been Professor at the Edsberg Music Institute in Stockholm since 2016. He plays a cello by David Techler, dating from 1711, formerly owned by Lynn Harrell.